This non-greasy and fresh face gel is designed for combination, oily and acne-prone skin with quick absorption. It supplies long-lasting moisture and forms a protective layer over skin for reducing water loss with the contribution of HY+3 Aqua-Channeling Factor and Perfect-Hydration 24 Complex. Regenerating Mineral Complex lifts skin vigor and revives skin energy from within. PURIgreen Complex™ helps purify skin and reinforces the skin barrier for healthy-looking skin. Unique Willowbark extract provides anti-bacterial property. Further enriched with Blue Lotus extract and Korean Centella Asiatica extract, it helps promote smooth and supple skin. Skin becomes beautifully hydrated and comfortable. 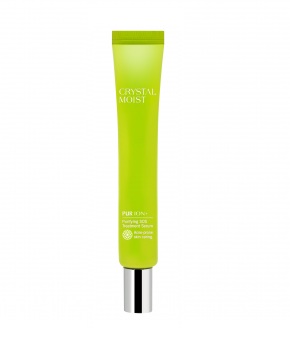 Continuous application perfectly refreshes and soothes skin with crystal-pure complexion. Apply desired amount onto face and neck after cleansing and toning in day and night time.